“My dream for The Gem Project is to continue to attend the TGP and to be the next leader of TGP. And to help children that are shy, i would help them by letting them participate a little more than the children that are not shy. I would like to do that because i was shy in the past but TGP helped me stop being shy, i want other children to fight their fear and to step to the next level. And i would also like to work with children all over The USA, and help our communities. Thank You so much. You can edit my dream if i have mistakes. 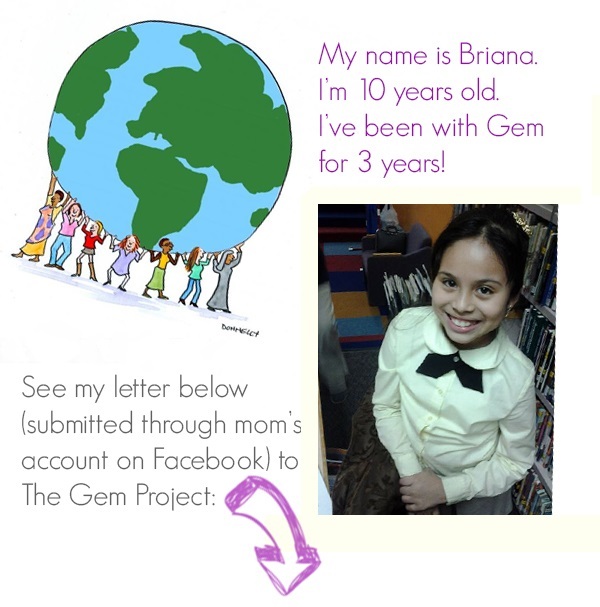 Briana and her sister Stacey, 8, have been attending The Gem Project Interactive Literacy programs since it started, three years ago February 2010. The program empowers youth through literacy in three ways by addressing an issue or concern each month from 1) an engaging discussion 2) a reading or writing activity and then 3) a team-building art activity. The program occurs weekly, usually on a Wednesday or Thursday. April 2011 we served 150 youths (1 month), visiting 5 sites in Newark. The sites included the Newark public libraries: North End, Springfield, Weequahic and Vailsburg. The school we served that month was Audrey West Headstart Center. What was our theme? Autism. After a reading from Holly Robinson-Peete’s book, “My Brother Charlie,” youth participated in an Autism Quilt portrait activity. A month later upon completing a different program, Tiffani (volunteer) was told to interview youth who participated in our program a month prior (April). We wanted to track knowledge retention by interviews and surveys. She decided to speak with Briana and Stacey. Briana and Stacey’s responses made us realize that youth are 1) watching our every move 2) they’ll commit, when we commit and 3) they depend on us. Two years later from that interview Briana took the initiative to write us that Facebook message, through her mother’s account, to us this January. 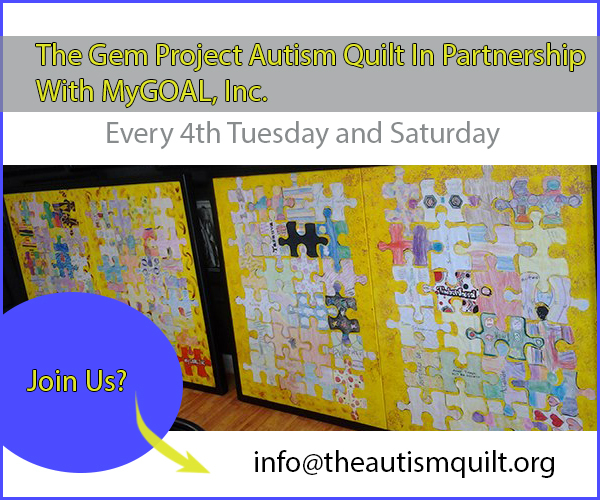 Project: The Gem Project Autism Quilt Program in Partnership with MyGOAL, Inc. This project is a collaborative program that was founded by The Gem Project and is in partnership withMyGOAL, a nonprofit organization that provides support to families and individuals on the autism spectrum. Through educational workshops, the project is able to inform the community about autism and the resources that MyGOAL provides. Upon completing the workshop, groups participate in creating pieces of art for an autism quilt portrait, which is then gifted to an academic institution. Self-motivated and determined, you’re the voice of this project. You routinely speak to schools and youth centers about The Gem Project Autism Quilt Program in Partnership with MyGOAL, Inc. Receiving volunteer training through MyGOAL, you’ll learn how to interact and serve individuals with disabilities, particularly those with autism. Energetic and pleasant, you welcome opportunities to lead monthly workshops and autism quilt art activities. In this flexible position, you can telecommute but must make all in-person training sessions and monthly workshops. Lead/organize monthly educational workshops about autism at participating sites that may include schools, youth centers, libraries and churches. Participate in community outreach programs to inform people about the project and its benefits. Willingness to participate in a mandatory volunteer training to improve the quality of our programs. Collect program evaluations, track program attendance and test knowledge retention of programs with directors’ guidance. Write monthly reviews about the events on the program’s website, theautismquilt.org. Volunteers can work remotely but must be present for their in-person: training session and any community outreach activities that they could attend. 3-4 hours for in-person workshops. Overall estimated monthly commitment: 25-35 hours. Please send in resumes to info@theautismquilt.org ; Cover letters are encouraged. The Gem Project, Inc. is a nonprofit organization that educates youth and young adults about various issues that affect them and their communities. Through the use of innovative programs and enrichment activities, The Gem Project strengthens the leadership and community organizing skills of our youth. Founded in 2006, The Gem Project has led numerous programs that have educated and empowered over 1200 persons. MyGOAL, Inc. is a nonprofit organization that provides grants, support groups, counseling and activities for families and individuals on the autism spectrum. Programs include an 8 week stress management program, Mom2Mom Espanola (Hotline) and Jump Start on Autism Class. Support groups offered are for men, siblings and women. MyGOAL’s services extend internationally through their Haven International Project, which provides training and support for families in Ghana, West Africa. [Holiday Inspiration] Madison is a leader and her mom is one, too! by The Gem Project We bring our Define Real Beauty Campaign to Newark Prep, a BLENDED school!